Environment - The Borealis Press, Inc. Available as a downloadable PDF. The printing industry is getting greener, largely because of people like you, and us. We all should be proud. Here are important facts that the environmentally conscious consumer may not know, but should. You’ll be glad you took a few minutes to read this. Virtually all paper is made from trees. Mountainous piles of logs are chemically cooked into pulp, and rolled into paper. There was a time when a lot of paper was made from other fibers, such as hemp, and that may happen again, but meanwhile just about all paper is tree-based. Paper mills have always recycled waste paper from the paper-making process, but in the past they didn’t like to admit it because it sounded “low quality.” Post consumer paper has long been recycled, too. If you’re venerable enough, you might remember the paper drives during World War II and the early fifties. Nowadays recycled and especially post-consumer recycled papers are at a premium. Various percentages of post-consumer content are required by government and other institutional buyers. However, recycling paper – especially post-consumer paper – has issues. To get a nice white paper, especially the quality that we use to print photographs in The Borealis Press Quote UnQuote series, all of the non-white stuff has to be bleached out of the pulp. With virgin pulp, that means bleaching the natural color of the wood fibers. With post-consumer pulp, that means washing out all of the ink that was previously printed on the paper. Think about it, but don’t try it at home. The 100% post-consumer board that we use for our Treading Lightly cards is hardly bleached at all. In the early 2000s environmental groups launched an effort to require chlorine-free bleaching in Maine mills, where much of yourpaper comes from. The paper industry objected, saying that you cannot do high quality printing on non-chlorine bleached paper. The legislators then saw twenty products printed by The Borealis Press using chlorine-free paper from Europe, all of which won prizes in “Printing Excellence Program” competitions. The objections were withdrawn and a compromise was reached requiring “elemental chlorine-free bleaching.” As U.S.-made chlorine-free papers got better, The Borealis Press switched from using European sheets. When our main supplier moved production to China and stopped using chlorine-free pulp, we found another paper manufacturer. Most ink was vegetable-based until the early 1960s, when petrochemical inks took over because they were about 25% cheaper. (It’s obvious why vegetable-based inks are safer than petroleum-based inks.) By the year 2000, about one-third of American printing had returned to vegetable oil inks. This is partly because vegetable inks tend to give clearer colors and reduce paper waste, but the main reason is because you the consumer demanded more safety, and the industry responded. At The Borealis Press we have used vegetable inks since the first sheets came off our old Miehle press (now retired) in 1990. Porous and non-porous parts of printing presses have to be cleaned between each job and sometimes during the press run. They have to be really clean so the next color is not contaminated. Imagine cleaning pounds of industrial-strength ink – absolutely every bit of it – off of a big machine. Again, that’s no job for your laundry room cleaner. Press wash chemicals are hands-down the most toxic part of the printing business. They make even petroleum inks look benign. The old and still common way to clean the presses is to use cleaners containing tuolene, methyl ethyl ketone, glycol ethers, xylene, tetrachloroethylene, and other world-class poisons. In 1995, American printing transferred over 45 million pounds of these toxins to some part of the environment. There are safe ways to clean. One is to use biochemical cleaning solvents that have various pros and cons but are certainly much safer – much much safer – than standard chemical solvents. 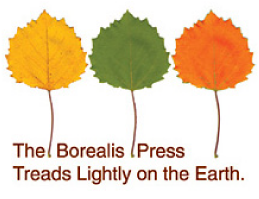 Another method is used by the plant that now prints Borealis Press products. This is to recycle, reuse, and filter solvents until the resulting effluent is deemed (by government agencies) safe to put into municipal waste systems. We’ve heard the printer say “it’s safe enough to drink,” but we suspect his brain is fried from reading too many greeting cards. The plant that prints Borealis Press products is a large affair with enormous modern presses as well as indestructible old Heidlebergs chugging away at die-cutting and embossing. There are computers and plate makers, big machines for cutting, folding, collating, binding, and packaging, and lots of experts. Now get this. One hundred percent of the electric power used in this printing plant (over 3 million kw per year) is wind-generated. That, folks, is a very low carbon footprint. And now, please hear this little editorial. More windmills have been planned for Maine and elsewhere. These windmills are opposed by some environmental groups and by many landowners or yachts–people who will be able to see them. The ostensible objection is that migrating birds and bats can run into the rotating vanes, but my son the wildlife biologist and my son the mountain man say that wind power is the cleanest power known, and its wildlife impacts can be easily minimized. The new windmill blades are thin and turn very slowly. I believe that most of the objections are because people do not want to see the things from wilderness spots or from their homes or yachts. This is poor thinking. The elegant new windmills on mountains in the U.S. and Europe and elsewhere are things of beauty, both in their design and in what they are accomplishing. Objecting to windmills when the alternative is fossil or nuclear fuel is dumb beyond thought. If we like the idea of wind power helping to make these cards, then we have to like the windmills.